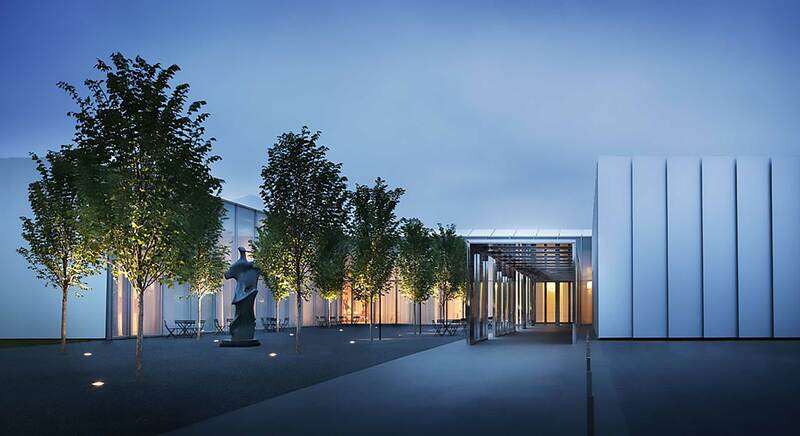 Set on 164 acres of rolling southern landscape, the North Carolina Museum of Art has created a stunning new home for its permanent collection. The new wing, with 127,000 square feet, establishes a close relationship with its environment, allowing natural light to flow seamlessly throughout the interior through a custom designed roof and ceiling system and shaded vertical glazing, integrated with the electric lighting. The skylight and ceiling system was designed for the project’s location and climate to provide even daylight levels in the galleries. Within the cavity of each ellipsoidal oculus, linear fluorescents supplement the daylight to generate a soft ambiance within the galleries. Programmed photocell -illumination controls adjust the contribution of electric light in response to a surplus or absence of daylight. Five voids in the building’s rectangular form reveal intimate courtyards to frame sculpture and landforms, furthering the relationship between the interior and exterior environments.